How do you physically envision your book? Do you see your novel as a jacketed 6×9-inch hardcover with a $24.95 price point? Are you writing a romance that you can see as a mass market paperback that someone can tuck in their purse or read on the beach? 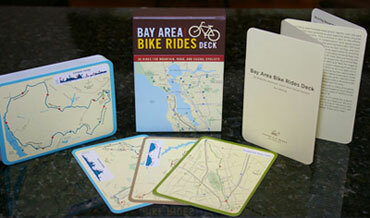 Or do you visualize something more fancy and eye-catching? Maybe a lenticular cover that flips between two images? Or a cookbook that comes in a recipe box? We both worked for publishing houses (Chronicle Books and Running Press) where format was always up for discussion in acquisition meetings. 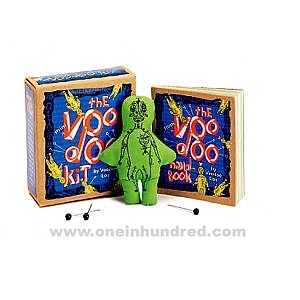 Our publishing companies specialized in gift products, where a compelling package can be the deciding factor in a customer wanting to hug it and pet it and call it their own. When it comes to your book project, we want to challenge you to think outside the box, or spine, as the case may be. If all the books on your subject are weighty, does a more portable, pocket-sized book make sense? Could you offer a unique material or special feature, like a waterproof fly-fishing guide or scalloped edges on a pretty gift book? Thinking about how you can make your book’s format special or unique can help catch a publisher or agent’s eye, demonstrates that you’re a creative thinker, and may just be the thing that sets your book apart from the rest of the titles in your subject area. When you compile your submission list, take time to dive into each publisher’s catalog. Do they have a pre-existing format into which your book would fit beautifully? Mention this in your proposal, as publishers already have pinned down the sourcing and pricing on these special specifications and will be able to assess your project with real numbers and real interest. Taking the extra time to think of how your book looks, as well as what it says, may be just the thing that lands you a book deal and drives sales. 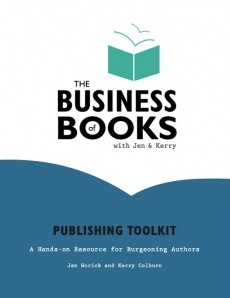 Learn more savvy tips on how to make your book proposal stand out in our Publishing Toolkit. Or subscribe to our monthly newsletter here. 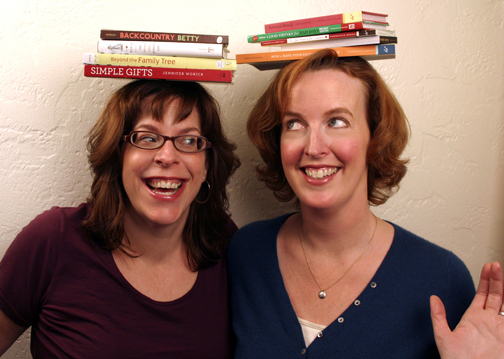 We started the Business of Books because we want to get writers to think like publishers. We want you to constantly remember that publishing is a business. As personal and dear to your heart as your idea may be, it is still a product that has to be sold. So you need to think about to whom you’re pitching. It’s not just about getting the right agent or editor to love your concept. 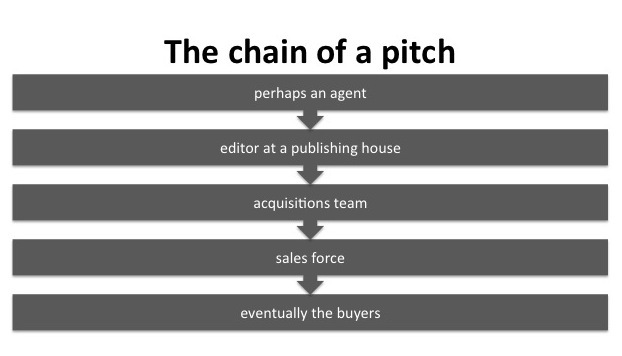 In reality, a whole team weighs in before acquiring your book—and your pitch needs to speak to everyone and answer the questions they might have. Use our handy chart to see who you have to win over before you book can hit the stands and hands of readers. We can help! We offer a Publishing Toolkit that will help you develop an on-point proposal that will address the questions of everyone weighing in during the acquisitions process. “How do I find the right publisher?” We get this a lot. Publishing often can seem like a mystery, and one of the biggest sources of confusion for an aspiring author is figuring out to which publishing house to submit. Here, in our experience, are some tips to determining where your book might find a happy home. 1. Go to the bookstore. Yes, an actual brick-and-mortar bookstore. You could also hit up the library. Describe your book to the staff and ask for books that might be considered similar to yours, in topic, voice, concept, or physical format. Look at the shelves and find the best competing titles. Now, look at the spine, title page or copyright page and note the publisher. If there is more than one book by the same publishing house, asterisk that name. 2. Look at acknowledgments page. 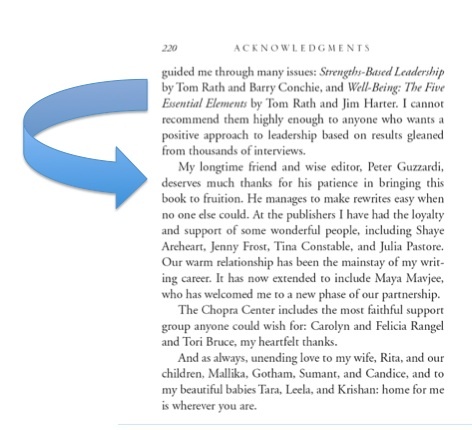 While you’re perusing the competition, look at the acknowledgments page (like the one at right, from Deepak Chopra’s The Soul of Leadership). This is our Nancy Drew/Hardy Boys tip. Unless the author had a falling out during the editing process, both the agent and editor will be named. Write those down, as this will further assist you in sending out targeted submissions. 3. Subscribe to industry newsletters. Publishers Lunch is a daily e-newsletter put out by Publisher’s Marketplace. For a small monthly fee, you can subscribe to it and search for recent book deals by key words, publisher, author or agent. We recommend signing up for a month and doing some targeted research to further refine your submission list. Shelf Awareness is a free e-newsletter that offers similar information but doesn’t have a robust search engine. 4. Look at submission guidelines. Now that you have your short list, finish up your research by going to each publisher’s website. Review their submission guidelines and see if they take unsolicited submissions. While you’re there, also look at their recently published books and mission statement. Does it jibe with your book? If a publisher does not take unagented submissions, all is not lost. Reviews agents (gathered during steps 2 & 3) in the same manner. Check out their submission guidelines and consider submitting your proposal to them. Regardless of where you submit, however, you will need a solid proposal to secure a book deal or representation. For more information on the book proposal process, register for our Feb. 9 workshop in Seattle or purchase our Publishing Toolkit. Write on!